What’s it Like to be a Game Designer? 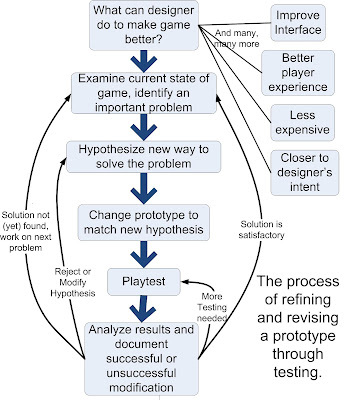 This is a vital topic in game design: are you designing a game or you throwing one together? Yes, creativity is part of game design, but it only amounts to about 10% of the whole. The rest is more or less engineering: you identify problems and propose solutions, implement the solutions, test the results of those solutions, and so on. Scientific method is involved in your testing, and engineering is involved in your solutions. Occasionally inspiration and creativity are involved. What game design definitely is not, or at least should not be, is trial and error. I'm using the meaning that was prevalent when I was young: guessing what might work, and then checking to see if it does. I now call it "guess and check", because there seems to be a notion today that trial and error is a form of scientific method. No, it's guessing. Game design is not a guessing game (though as in all other creative or engineering endeavors, sometimes you get a lucky guess). Let me use an example from a beginning programming class to illustrate. While I was a college teacher I substituted for a teacher who was ill, in a programming class for beginners. Many the people were not going to become programmers, but everybody was required to learn some programming, which made good sense in a computer department. The students in the class already had a program to work on, a simple one, so I walked around trying to help in general, as their programs didn't work. This is not surprising. Programming is very logical, and people often are not taught logical methods in K12. The proper response when the program isn't working is to figure out the program flow, identify where it went wrong, change the program, and test the solution. It works the same way in game design. 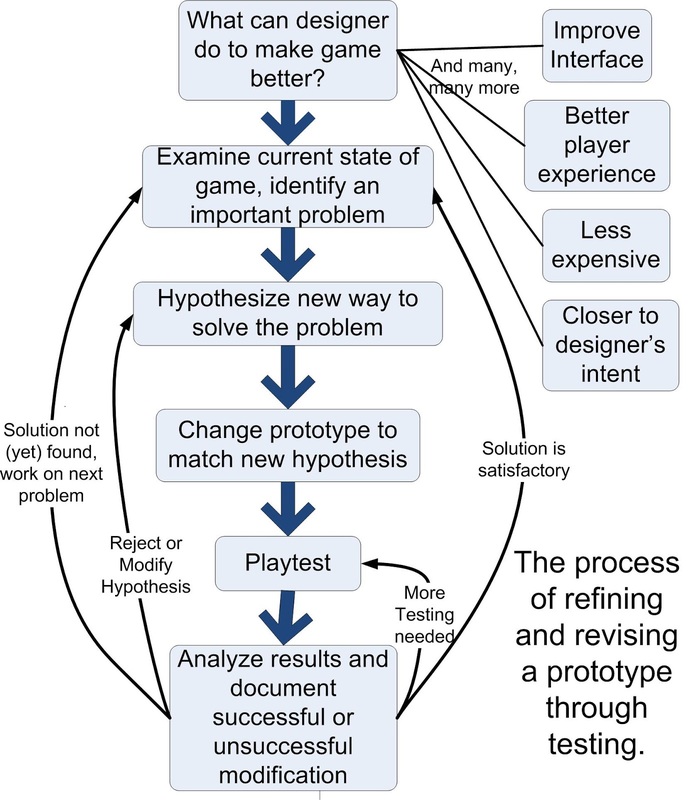 Much of the purpose of playing a prototype is to identify problems and test solutions. This includes some intuition, and the solution might involve some creativity, but mostly it is logic. But what did the students do rather than try to figure out why it wasn't working? They just guessed, changed the program in accordance with their guesses, and compiled/ran it again to see what happened. If that didn't work, they guessed something else. They were using traditional trial and error, guess and check, and they were frustrated, of course, because it wasn't working. I tried to show them how to figure out the logic and flow of the program rather than just guess. Game design ought to be the same way; some people won't do it that way but I think it's the most efficient way, and it's the way that I like to teach people. Certainly different people have different design methods. Some design more from the gut than from logic. But it still involves hypotheses and tests: if you're actually designing something you are primarily using your brain in an organized way, I hope, and not just relying on inspiration. Inspiration is not very reliable. “Inspiration is wonderful when it happens, but the writer must develop an approach for the rest of the time . . . the wait is too long.” (Leonard Bernstein, the composer and conductor - and writer.) Inspiration comes and goes. The more you treat the modifications of your game as an engineering problem, the more efficient you're going to be. Some people may think of a game as art, rather than craft, and the more that you think of it as art, the more you might be inclined to rely on inspiration and intuition. So we might say that you're not designing a game, you're creating a game, though it's mostly craft once you have a playable prototype. A playable prototype is going to change a lot if you're doing a good job. Game design is not throwing things against the wall to see if they stick, which is what trial and error and error amounts to. It's "try this and see what happens. Then let's try that and see what happens." Some things might happen better than others, but it's a terrible way to solve a problem. Why Do People Design This Way? When I did the video version of this piece, I had not realized why this guess-and-check method might be common. Unfortunately, changes in game playing have led to much greater use of trial-and-error (guess-and-check) than in the past, and to puzzle-solving rather than problem-solving. When I was a kid (more than 50 years ago) I searched for games that required you to think to succeed, but which were not abstract. The classic games such as chess and checkers were just too abstract, I wanted something that represented, modeled, some (possibly fictional) reality. Avalon Hill's wargames finally filled the bill for me, followed by Diplomacy (for more than two players). With the advent of video games, gaming became a matter of athletic skills more than brainwork. No matter how well you could think, if you didn't have the reflexes and hand-eye coordination needed, you'd not be good at most video games. Video games were athleticware, not brainware. Moreover, video games tended to be single-player puzzles, where there was an always-correct solution, owing to the inadequacy of the computer opponent. There was no substitute for human opposition. When you play an opposed game of strategy, a game you can lose - which is usually a tabletop game - you cannot afford to simply guess at what to do. That's the road to Loserville. But now we have so many single-player and co-op video games, games where you can save the game at will. Many players try lots of different choices to see what works best, saving each one, and then use the best to move on to the next challenge. They don't have to figure out anything, they can just guess-and-check. In the extreme I know of someone who, finding a chest with random contents, will open it, save it, open it again, save it, and so forth, dozens of times, in order to get the best result. Ridiculous! Alternatively, some play games with online help open. If something isn't working well, the player will look up the best way to "beat" it, and continue. But it's these kinds of mentality that are the opposite of what you should be doing when you design a game. These mentalities amount to "throwing things against the wall to see what sticks." Further, with the advent of Eurostyle games in the latter 90s, we entered the era of parallel competitions (which I called "contests" in my book Game Design), players all trying to solve the same puzzle. Even though there were usually several different solutions ("paths to victory"), they were still always-correct solutions. Many tabletop gamers became puzzle-solvers. People learned to look for the solutions, because they didn't need to worry about the opposition. Some games coming out of the Euro style transcended this, but most have not. In designing a game, you do have, in effect, a "Save Game" option. Because you can try a solution you've devised, and if you decide it doesn't work, you can go back to the old way of doing it. But this takes a lot of time (one playtest often isn't enough to determine the success of a modification). Maybe you have lots of time to waste guessing at changes, but I certainly don't, nor does anyone who wants to design for a living. Furthermore, knowing that there's always a best move (as it true of puzzles) is quite different than having to decide among uncertain alternatives, as in a typical wargame. Game design is problem-solving far more than puzzle-solving. There is rarely an always-correct solution in game design. As a result of these changes in how games are played, many people who want to become game designers have learned the wrong ways of doing things, learned the wrong set of skills, to design games! Obviously, not everyone plays games this way (I don't, even when I play a video game), but the majority of gamers do. I've seen the throw-against-the-wall method dramatically illustrated. Recently a beginning tabletop designer had his simple, multiplayer, 30 minute game, which involved cards and scoring only, playtested by players new to the game. The game had already been successfully Kickstarted but clearly it was far from done. Most of the cards were handwritten (not even computer-generated) for example. He also made the error of playing the game without having any rules with him (to test the rules as well). I asked why? His response was, he played it six or seven different ways, and was also changing it to satisfy backers as well, so he didn't bring the rules! So here we had a game that was already Kickstarted and the rules writing wasn't being tested. When he said he was trying out a particular rule change my reaction was, how can you try a change when the rest of the game isn't stable? You're only trying to change one of those half-dozen ways to play. When you playtest, you playtest the whole game, not just the part that you're experimenting with. If the rest of it keeps changing, how can you evaluate the effect of one change? My next question was, how are you recording the results of the playtest? He said he usually had a notebook, but not today, but he did have a laptop and he took notes after he was eliminated. (Yes, he played in the playtest, worse, without rules at hand. Bad Idea.) I can point out here that it was a game with player elimination, which is not desirable nowadays, even in a 30 minute game, and it was a scoring game yet he hadn't bothered to bring the scoring devices, so everyone scored on their smart phones. This is just sloppy. You've got to test the actual game, not substitutes! As an aside, why is leader bashing undesirable? It takes the strategic decision-making out of the game, you just attack the leader. It makes people want to sandbag (if they can), they don't want to be the leader until the very end. In fact, given the nature of the game, there was virtually no decision-making involved. You picked your strongest attack that could affect someone in or near the lead, and that was it. I'm not opposed to simple, even shallow, games, but they should still give players viable choices, the "horns of a dilemma" of traditional board games. This one didn't. To continue with this egregious example, what we have in this designer is a case of somebody throwing things against the wall to see what will stick. He tried to playtest the game in various ways to see what seemed to work better. It seems to me to be trial and error in the undesirable sense. It also helps show that Kickstarter is often about ideas and intentions rather about an actual game. He had a little bit of the art for the actual game for a small number of the cards and that looked quite good, and probably helped the Kickstarter a lot. So let me talk briefly about the proper way to go about this part of design, not just trying this and that, not throwing things against the wall. I use a fairly detailed diagram and a simpler version. This is an engineering design process. It's also something like project management, because each time in project management you're doing something that's rather different than what you've done before. I'll discuss this simpler project management diagram here. The Plan is about you creating the game to the point where you have a playable prototype. Execute is playing a prototype, first of all solo, then other people. While a game is being played, you Monitor whether it's doing what it's supposed to do, whether it's going according to your plan, the vision you had in your head. Control is when you monitor something that isn't going to plan, you do something to fix it, to make it work the way you want to. Successful changes go into the Replan, where you modify your prototype. Then you go back to Execute and you play it again, and you keep going round and round on that, gradually making your game better. Game design is lot more than that, though. Unlike scientists, in most cases you have to rely on relatively few tests. (Nowadays in video games we see "open beta" testing, and testing after release, in order to increase the sample size and use statistical methods of analysis.) Unlike the scientist you're making changes in the design, an actual product, as well as experimenting to see what happens. Fortunately, this is usability testing, not scientific testing, and usability testing does not require a large number of trials. I strongly recommend that you check out the Nielsen Norman Group's website at alertbox.com, and read their articles. They are talking about web design usability, but most of what they say applies to game design, especially video game design where user interface is very important. We have user interfaces in tabletop games, but they have over many centuries settled down and don't change rapidly. Being a literal-minded person, I don't venture into analogies much, but I'll try one here. This question of engineering versus trial and error (guess and check) is comparable to how people learn software or home appliances or electronics. Unlike most people I read the manual. It's amazing how much you can learn that way and it's far more efficient. But what most people do is a just dive in and try things, or they simply remain ignorant. I read the manual and find out all you can do (if it's a good manual) that most people who just dive in and try things are not going to figure out. The engineering style of game design is like reading the manual, the trial and error style is like diving in and trying things. It's much less efficient, but it is easier, just like not reading the manual is easier, and we can apply this to games. I would rather read the rules to a tabletop game in order to learn it, unlike most people who would rather be taught. It may take longer, but I miss less when I read the rules and understand the game better when I read the rules, if they're good set of rules, than when somebody teaches me. I've discussed the whole cycle of testing and modification in my "Learning Game Design" course on Udemy.com, and there's also a course just about Playtesting. The major point to make here is that you follow a process that relies on solving problems you've identified. You also have to know what kinds of problems might occur, like leader bashing in a card game, and that's why I make so many of my videos to educate people about those possible problems. Method is important, and trial and error (guess and check) is poison unless you have no choice but to use it. If you rely heavily on intuition or inspiration, more power to you, but that's not something that I want to teach aspiring game designers. If you think it's all about inspiration, I think you're dead wrong, any more than getting ideas is all about inspiration. You have to work at something to do it well on a consistent basis. You can't hope to be bailed out by random flashes of brilliance. As a teacher I want people to understand a good, efficient method: "inspiration," "intuition," and especially trial and error (guess and check) are not good, efficient methods. Design a game, don't guess at it. (Originally written in 2009. And we now see, with Unity, how much easier it is to make video game software than in 2009.) I don't regard video games as fundamentally different from non-electronic games. There are tens of thousands of non-electronic games that were never touched by a programmer. If the video game designer had some "magic" (technologically advanced) way to create the software - and as time goes on and technology improves, this will be the case - then programmers would be unnecessary. That's why I regard programming as a necessary evil of video games, not fundamental to games. It is already the case that someone who isn't a programmer by training or inclination can create the equivalent of Pac-Man with Gamemaker in a fairly short time. More and more complex video games will be made without trained/professional programmers. Ultimately, programming is "donkey work," something that ought to be done by machines. But I could say the same about many kinds of work. Some of those kinds of work have already disappeared or are disappearing, some will disappear. Programming is going to be done by machines--already is, in many cases, though the machines are using software created by programmers - long before design or art is done by machines. I read something recently about a game covering the fall of Rome in Britain, and about incorporating Arthurian stories into it. Yes, I included Arthur in Britannia, but that was literary license, not history. A big reason why history changes so much from one generation to the next, is that so much of it is malleable rather than certain. History becomes, not fact, but fiction intended to appeal to the desires or needs of contemporaries. "Pop" history, video history as we sometimes see on the History Channel, is a reflection of this. It's history as modified by what "the masses" want it to be. One reason why Magic:the Gathering became successful is that it was, if not the first game, one of the first games where the main interaction is between the cards of the two players, using special powers that are exceptions to the rules. That has been generalized for many card games, it's a kind of game that's easy to make, and I know several budding designers whose first game is of this type. I am not a fan of them because they don't have anything do with reality. Some of the people who are designing the games may think so - but there's a weak grasp on reality these days. Yu-Gi-Oh is even worse because lacks the constraint of "lands". For me any "theme" in these games is just a gloss. It's not something that actually affects how the cards are played or how the game is designed. It doesn't help people understand how the game works, either. My name for this kind of game is "Special Powers Card Game" (SPCG). Pundits are still pontificating about whether virtual-reality games (VR) will succeed as a business, and have been since the announced release date for the Oculus VR with the anticipation that it’s Valve and Sony competitors would be not far behind. I have not used one of these contemporary VR systems, and I read that people who do are often converted to the cause. My experience goes back some decades when (at a convention I cannot otherwise recall) I put on a primitive VR-like device. It was suspended as a pair of eyeglasses, but with one side empty and the other side occupied by a small module. That module produced a red dot on black screen display (this tells you how old it was) that substituted for the screen display of typical computers of the time. You could see the “screen” with one eye while the other could see your normal surroundings. I didn’t try to play a game with it but I was quite impressed with how very well it substituted for a screen. I also recall, in the early to mid 90s, watching a graphical “virtual tour” of a part of the new Womack Medical Center that was being built. The 486 computers of the day really weren’t fast enough to render the tour in more than slow motion. It was quite fascinating nonetheless. Within the past six or seven years I’ve also been in a virtual-reality chamber where three walls showed a seascape and you could walk around looking at it. Recognizing that computing power is still advancing rapidly, and thinking about how the graphical capabilities of computers have changed from the old ASCII graphics to modern 3-D, it appears to me to be inevitable that VR will succeed sooner or later. Too many people want to reach the Star Trek holodeck stage for maximum immersion. Whether the current products will start that progression, or fail as those of the past have failed, is subject to all kinds of chance and unforeseen factors (such as hygiene?). Remember, the best products don’t always prevail in the marketplace (Betamax versus VHS VCR for example). Timing is very important, and we have no idea, even now with products out there, whether the timing is good. For the first time in a few years, I refereed a fantasy role-playing game. In this case I was using my own simplified rules (“Basic (Fantasy) RPG”), in order to playtest them, and I was running a game for my usual college playtesters. Keep in mind that I started playing D&D in 1975. The title refers to how things are a lot different than they were in 1975, at least in role-playing games. Role-playing games have been badly influenced by video games, where you cannot lose because you can always go back to a save game, then worsened with MMOs and free-to-play games. The practice there is to constantly reward people so they'll continue to play, so that ultimately spend some money on in-game purchases/transactions. So the players were constantly wondering where the loot drop was when they bumped off a few kobolds that wandered by, or some other wimpy monster. But worse, I saw manifestations of something I read about recently, where players frequently experiment with items to try to find “creative” ways to use them, and expect the referee to accommodate them. (For example, rub a little healing potion on a wound and expect it to heal it.) One player had been captured and probably killed (as far as other players knew) by a fairly powerful monster; he was unconscious. In his backpack, wrapped up in a bag, he had a crystalline disk, about the size of a frisbee, that they picked up from some phraints (thri-keen). He wanted the disc to slip out of the bag, somehow, then out his backpack, and cut the monster in half! I just looked at him and said no, but he had already decided that there had to be a chance for it and rolled dice as though he was rolling for it. I told him, if I were to give you a roll for that, and I don't, you'd have to take 10 six sided dice and roll six on everyone. (The chances were actually MUCH worse than that, but it was enough for me to think he’d shut up. No, he proceeded to gather up 10 six sided dice and roll them. (Keep in mind, this lad is a freshman and appears to enjoy being an annoying younger brother.) It didn’t count, of course, and of course he didn’t come close to 10 sixes. There was another player who was constantly trying to do tricks – what *he* called creative – with the dead kobold that he carried around on his back. He evinced astonishment whenever he couldn't do what he wanted, and at one point he even said “you’re interfering with my creativity.” Well, creativity has to be associated with reality, and many things he was trying to do just didn't make any sense. That's not creativity, that's brain fever. Now I know that many younger people playing role-playing games indulge in this kind of so-called creativity all the time, but I won't have any of it. Creativity in problem-solving is desirable, but not when flying in the face of physics or other realities. Another of the things he felt he ought to be able to do, is run away from some enemies who were beating on him (melee), then stop, turn around and shoot them in the face with his self bow. I said, these guys are right on top of you. You turn around and run away, when you turn back to shoot them they're gonna be there and they're going to break your bow with their weapons. If nothing else. He didn't seem to understand how that would be. Of course, in some game rules when you run away like that the opponents get a free attack on you and then you could pull off what you said. I was treating it like a realistic situation in this case - it was a playtest - and there was no way he could do this. It was also a one-shot game rather than a campaign, so they didn't take it as seriously as they might have otherwise. At least they enjoyed it. In olden days you had to “train” players to accept limitations. I suppose that’s true today as well, but contemporaries strongly dislike constraints, and often want this kind of game to be a playground, not a game where you have to earn something. The “exigencies of life” (and hurricanes) have interfered with this blog. I still (until the past couple weeks) post a screencast (video) each Thursday on my “Game Design” YouTube channel (http://www.youtube.com/user/LewGameDesign). This variant is partially based on H.G. Wells' novel, "The War in the Air". Written in 1907, the book depicted the development of air forces which were both very destructive and cheap and easy to build. The main force were huge rigid-framework hydrogen-filled airships (known in 1914 as dirigibles or Zeppelins). Wells however did not foresee the real expense and maintenance required. Also, dirigibles were very vulnerable to special bullets fired by aeroplanes (such bullets did not exist when Wells wrote his novel). For purposes of this variant however, we assume Wells to be partially right; dirigibles are stronger than they were in World War I. 1. There is an additional type of unit, the dirigible air fleet (D). Several huge airships and heavier-than-air machines carried by them comprise a D, which is relatively cheap to build but also fragile. 2. Each supply center yields five supply points (SP) each game year. Each year it costs the following to supply a unit: Army or Fleet - 4 SP, Dirigible - 3 SP. SP may not be accumulated or transferred to another player, so any extra are lost. 3. The game begins with a 1900 building session. Using their SP from home supply centers (15 except Russia, 20) each player builds units of this choice in his home centers. A dirigible may be built in a center which also contains a normal army or fleet. Russia, however may not build fleet ST. Pete north coast in 1900. 4. D orders are treated as an additional set of conflicts taking place above armies and fleets. As well as acting for and against one another, D's may support an attack on, or defense in the space directly "below" (the one the D occupies), but may not themselves attack. Therefore a D cannot cut support by an army or fleet. Armies and Fleets have no effect on D's. When a D supports an army or fleet it may not do anything else and an attack on it by another D will cut the support. 5. Only one D may occupy a space, but an army or fleet, even one belonging to another player, may also occupy the space. 6. If a D is dislodged, it is automatically disbanded. 7. A D cannot be built in a center where a D of another player is present even though the opponents D cannot capture the center. However, if the country is entitled to a build, an army or fleet may be built if the center is not devastated. 8. A D may not capture a supply center, but if alone in the center in spring or fall it may "devastate" it. A unit may not be built in a devastated center and it is not counted in supply center totals, for the next adjustments only. Afterwards it reverts to normal. A player may not devastate a center he owns. 9. A D may not transport an army. 10. A player wins when he owns nineteen undevastated supply centers. My vaguely Stratego-like game Doomstar (video version of unpublished tabletop game) was released on Steam September 16. Another, (tabletop) Pacific Convoy, is supposed to be published by Worthington Publishing, though one can never be certain about such things. Continuing to move further from Stratego/L'Attaque (from which Stratego itself closely derives), I'm trying to create a Steampunk game "The War in the Air", that will use plastic figures with numbers on the bottom, reminiscent of the old comic-book-ad game Convoy Terror (https://boardgamegeek.com/boardgame/14486/convoy-terror). In Convoy Terror there were several different sculpts of ships, for example, a set of destroyers, a set of cruisers, and a set of submarines. But the strength numbers on the bottom of each cruiser differed from one another, as did the strength numbers on the bottom of the destroyers, though you could be sure that a cruiser could beat a destroyer. The ships moved on a rectangular map in rectangular locations, but it amounted to the same kind of board as Stratego. If you think about it, though, you gained a lot of information from being able to see the difference between a submarine, cargo ship, battleship (there was only one), etc. What I intend is to use baroque steampunk notions, such as dirigible juggernauts and steam bombers and diesel fighters. I'll also use ships and possibly land units, again resorting to such things on land as massive slow juggernauts and steam tanks. The numbers on the bottoms will overlap, that is, a strong unit of a weaker general type will be able to tie the strength of the weaker unit of the stronger general type. This will all be on a hex board where units will be able to move their speed (usually more than one) in a straight line only, except for the aerial units which will be able to move in a dogleg. With good sculpting it could look really interesting, and looks seem to count for a lot these days. In Convoy Terror you had 10 cargo ships and the objective was to get cargo ships through to the other end of the board. I adapted a form of that in Pacific Convoy, where all unit identities are hidden as in normal Stratego. I'm not sure yet what I'm going to do in this game, which depends partly on whether I include the land element or just air and sea. If I include the land I'll have ports/cities and you'll have to control three of the four to win the game. By the way, "The War in the Air" is the title of a novel by H. G. Wells that I read a few decades ago. It was written before World War I (1907) and posits a war of airships and flying machines that more or less destroys civilization. (In the early 20th century people did not understand how resilient civilization can be.) It fits with the idea that the aerial arm is much stronger than was true even in World War II. But I don't intend the game to be a representation of the book, I just like the title. Of course, titles of games do change. "Does playing board games with people always lead to frustration and anger?" Of course not! Even with traditional-style board games that are directly competitive, most people remember most of the time that IT'S A GAME, not real-world. A particularly cut-throat game like Diplomacy or Age of Renaissance may engender more anger than others, but there are lots of quite peaceful board games as well. Moreover, there are co-operative board games, and solo board games, where there is little or no conflict among players, who are playing against the game system, just as players usually do in video games. There are certainly board games that are designed to de-emphasize conflict, to reduce emotion, usually because they are fundamentally puzzles rather than traditional-style games. Often they are so abstract that despite decoration/atmosphere, they have nothing to do with the real world (which tends to reduce unwanted tension). These games allow people to progress in their efforts to solve the puzzle, even if they don't do as well as someone else. They're parallel competitions where players can do little or nothing to hinder one another, like many Olympic sports, rather than direct competitions (such as in major-league sports). Most Euro-style games are of this type. I personally dislike this kind of puzzle-game, but they're very popular with many older folks, especially those who don't play video games. If a person cannot accept that "it's a game", if a person cannot stand away from their own self-centeredness/ego, then they shouldn't play the kinds of games that provide direct human opposition. There are lots of ways to play against the system (computer or other programmed opponent as in co-op games) if the psychological side of game playing does not appeal. It's the boardgame in video form, not something designed as a video game from scratch. Works just like the (two player, turn-based) tactical boardgame. You can play against the computer (AI is weak), but it's mainly intended for playing against someone else online (which could include two computers in the same house, I think). It is vaguley Stratego-like, but much quicker (15-30 minutes for most games) and much more fluid. A big reason why "the unwashed", those who are not into video games as a culture, tend to treat video games as "kid's stuff" is this childish egotism. So what? The "unwashed" includes a large fraction of the country, especially of older people, the people who lead opinion and who make financial decisions. It would be easy to write an article titled "When will video gamers grow up?" In video games we get a very vocal segment that appears to hate women, apparently seeing them as rivals. The root of #gamergate is males who measure their self-worth through gaming, afraid of female competition. I am also convinced that a significant proportion of rabid Hilary-haters use a different standard than they would with any male political figure, because she's a woman. If she were a man, Trump wouldn't stand a chance. “Snowballs” that cannot be stopped are a design flaw. But not uncommon these days. Recently, Oliver Kiley described his desires for a 4X (eXplore, eXpand, eXploit, eXterminate) video game that did not rest largely on warfare. His idea is to have players compete to Transcend, for the race to rise to a higher plane of existence. The problem is that if the players cannot compete with one another in a way that hinders or harms the others, then you're back to a multiplayer solitaire (parallel competition) kind of game, which I wouldn't want. I think Oliver wouldn't want it either. So the question I've been asking myself is what can we substitute for all-out warfare that still enables players to affect each other as they try to achieve their objective, whether it's Transcendence or something else. The not-so-long-ago concluded Cold War is the obvious example, but I have been reading a maritime history of the world, and you to use in a game the kind of competition that the Portuguese, Dutch, English, Spanish, and others waged during the age of European expansion. This was sometimes called "no peace beyond the line", a reference to the virtual line drawn by the Pope to separate the Portuguese and Spanish areas of control early in the age of expansion. English, French, and Dutch, but especially the English, harried the Spanish in the Spanish Main and even in the Pacific Ocean, raiding their commerce and sometimes attacking their towns. In effect, there were rules of engagement, rarely broken, that usually prevented the competition from becoming all-out war, although all-out wars did result at times. While at WBC I was told about a game that offers only three possible actions, and suddenly decided I'd like to try making a tabletop 4X game with 3 or 4 actions, to be played one action at a time in turn! It's intended to be the essence of 4X, as simple as possible so that players can concentrate on strategy, certainly not on resource management. You could try to combine Explore and Attack in a "Move" action, or Colonize with Explore or Build, and I may experiment with these combinations. But the list seems good, and as I couldn't make a full prototype and play it while traveling, I thought more about the game. I want a typical action to involve just one ship/fleet. At some point I realized that the Diplomacy model of movement and support would work, and adopted it here in a turn-based form that I've used in one other game years ago. I have a board I created for a co-operative space wargame that I've modified to try in play. But mainly I tried to think of add-on modules, sets of rules that could be added to the simplest base game. So far I've come up with a Dipomatic module (possibly including forced non-aggression pacts), Sabotage, Trade, Technology, Culture (which could lead to "Transcendance"), and Commerce Raiding modules. Orbital Forts and Bishop's Rings (Halos) can be included in one module or another. Now I have to make a prototype and test the basic idea. Delayed because "Britannia in Outer Space" has taken precedence! I hope to get my comments about WBC and GenCon up here pretty soon. ICYMI, the list price for my book "Game Design" has been nearly halved, to $19.99 (was $38). That's also reduced the ebook price to $9.99 (Kindle). This is much less than the price for any game design book I know of (not counting "anthologies" with many authors). When I started this blog a dozen or so years ago it was mostly a personal blog where I discussed what I was doing (in connection with game design). Gradually it became more formal, more like magazine articles at a time when magazines were disappearing (especially the paying ones). Some of the material in my book Game Design: How to Create Video and Tabletop Games, Start to Finish, which I finish writing in 2011, first appeared in the blog. After the book I started making videos for online audiovisual classes, as well as my Game Design channel on YouTube, and I wrote less. I’m starting to write more now - haven't recorded a video in five weeks - but some of it is informal, the kind of stuff I used in the early period of the blog. I think that’s going to continue. What have I been doing (in game design) post WBC and GenCon? I had to get some stuff together to send to publishers that I talked to at the conventions, but mainly I’ve been trying to put together prototypes and play the four games that I devised in the 2 ½ week period I was away from home. Not only can conventions be stimulating to the imagination, the long drives (nearly 2,200 miles altogether) offer the opportunity to use my PDA to record voice notes about games. In effect, I tried to design games while I’m driving. Sometimes this works, sometimes it doesn’t, but it’s considerably more likely to work when I have just been at a game convention. Of course, some of the ideas never get beyond those voice notes, or transcription of the voice notes into Info Select (my old and expensive free-text database). But this time, three are taking shape and two have been played, one solo by me, another by players without benefit of me playing solo beforehand. That’s a first, but the (admittedly simple) game turned out to work very well. The first game I thought of, and the one that most excites me, and also the one I’ve played solo four times, is “free-form Britannia in outer space!” I have used the free-form techniques I’ve devised and tested for the introductory version of Epic Britannia and for Conquer Britannia (the broad market version of Britannia. Why am I doing this? It’s all Scott Pfeiffer’s fault. At WBC Scott - who was known as one of the outstanding players of the Avalon Hill version of Britannia - played in all three heats of the tournament. He cheerfully told me how the old version of Britannia is the best game ever while the newer version (second edition, Fantasy Flight) was a good game but not nearly as good as the old one. I disagree with him, but as we discussed the games it became clear that what he objected to was the additional constraints added to the second edition. The game comes first in Britannia, but it’s also intended to be history, and this perpetual floating was not historical in any way shape or form. But in a space wargame you’re not constrained by history, so I can use what I call the free-form techniques that tend to ignore history, to make an interesting game. Players still have four nations - well, species - but the other players don’t know three of the four until they actually turn up! The point scoring depends on a “scoring center” that the player can move around as the game proceeds. Many of the historically based constraints have been removed. I can also keep the number of pieces down somewhat via a smaller board, so that at present no species can have more than 10 fleets. And to compensate for the smaller number of fleets I have each fleet roll two dice, and it takes two hits to destroy an enemy fleet. Who knows how players will react to it, I think it is closer to the spirit of Risk insofar as there are fewer constraints, and that’s what people like in a certain kind of wargame as epitomized by Risk. We’ll see. I love space wargames that I love designing space wargames, but I’m not sure there’s much of a commercial market for them. In the end I design games because I enjoy designing games, so I continue to pursue this one. The second game that’s been played is a pure specialty card game, that is there are 110 cards and no other components. It’s meant to depict wizards sending out their minions to explore various areas and try to collect loot. The wizards cast spells to help out (or hinder their rivals) but they don’t get personally involved in the actual fighting. I managed to get a prototype of this game done on the day of the first meeting of the semester of the NC State tabletop game club. It’s quite a simple game, so I decided to ask the players, some of whom have played my games for three or four years, if they were willing to play a game that I had not played before. They agreed, and it turned out to be one of the quickest playing games I have ever seen, not quick as in a short time to complete the game (though it can be), but a short time to complete your turn, so that in a 4 player game it seems like it’s your turn almost as soon as you finish your previous turn. I had not planned the game to be so quick playing, it just happened. A bonus of playing a “not played before” game is that the players offered lots of suggestions for new cards. I’ve added 16 new ones (and deleted 16 old ones) to see how it goes. My next task is to get the third game together to play. It’s a 4X space wargame cut down to bare essentials. Several years ago I was reading a column in PC gamer written by Desslock, who has been writing about computer RPGs for many years. He likes skill-based development systems because players improve in the capabilities that they use rather than allocate experience points to whatever improvements they choose, perhaps being required to “train” in those new abilities. To him it makes much more sense that you improve in the things you actually do than those you train for. Bear with me a while here as I veer into teaching and then back to RPGs. I agree, though as a teacher I recognize that a good teacher can convey their experience to enable someone to avoid the lessons of the “school of hard knocks”. I also recognize that it’s possible for someone to do something over and over but to do it poorly in a way that does not lead to improvement. But as I read I realized that, in the United States at least, a great many people believe that training is the best way or the only way to know how to do something. I remember one 18-year-old student telling me a few years ago that he and his classmates had been taught in high school that the only way to learn how to do something is to take class for it! This was a student in a game design class; OTOH I certainly never had the opportunity to take any game design classes but I do pretty well at it and know quite a bit about it. It does not matter, unless the school is willing to go through a lengthy portfolio process, that you (for example) worked in networking at a major medical center more than nine years before teaching networking classes. If you don’t have a networking degree you are not qualified to teach networking, even though networking degrees did not exist until about 15 years ago and consequently anybody who went to school before that could not possibly have a networking degree. (These are actual experiences, not theoretical.) One college president told me that a person with a PhD in zoology was deemed by the accreditation people to be not qualified to teach freshman biology - zoology and botany are the two major divisions of biology - and as a result the school terminated the teacher! If this had been anticipated, or the school had been willing to disagree and create a portfolio for the instructor, he almost certainly would have been deemed qualified. But schools are very rarely willing to go to this trouble. So we get a situation where, for example, the founder of creative writing as a curriculum in universities later said it should be done away with. The major reason for this is that the people who have actually published novels and other kinds of creative writing that people pay money for, do not usually have Masters or PhD degrees in creative writing and so are “not qualified” to teach creative writing. The people who are officially qualified to teach creative writing have gone through creative writing programs but may not have had anything published commercially. What we tend to get in colleges and universities for teachers is people who have gone through undergraduate school and then graduate school and have a Masters or PhD in their subject, but have never actually practiced it in the real world. For some subjects there is no way to practice it in the real world but others are very much practice based. Computers are ideal for skill-based development because the computer can keep track of what you did and raise your capability as you go along. This is much more difficult to track in tabletop RPG’s. Because there are so many kinds of game designers, the answer to the question is the same as the answer to many questions about game design: it depends. For example, almost all of the time I can design whatever kind of game I want to design, and either I find someone to publish it, or I self publish it (which I personally do not do, but most tabletop designers do these days), or it doesn’t get published. Someone who is working as a game designer full-time may be lucky enough to work on a game they want to do, but much more likely will be working on a game that someone else decided is the one the studio needs to do. Indie video game designers tend to fall more into the freelance category in this respect, they’re on their own. Video game designers tend to work on one game at a time, the one they’re trying to prepare to be published, while experienced tabletop designers tend to work on a lot of games in a given segment of time. The difference comes from how long it takes to get a game to a decent prototype. There is no programming or art or sound required for a tabletop game, so you can get to a good prototype relatively quickly, compared with a videogame. And from the good prototype to the final takes far longer for a video game than for a tabletop - the publisher takes care of production for the tabletop. That is, if the designer has licensed to a publisher, rather than self publishes. Tabletop designers often spend a great deal more time involved in playtesting, than video game designers do. Much of that is because video games are designed to be played right out of the box, whereas someone has to read the rules of the tabletop game. And of course you can make as many copies as you want of a digital game at no cost, to send to playtesters. So it’s relatively easy for a video game studio to send their game out for “blind” playtesting (testing where the players have no knowledge of the development of the game). Tabletop designers spend much more time overseeing face-to-face playtesting of their games than they do actually designing them. Video games can also go into “Early Access” or some other kind of pre-release and even post-release testing that is not possible for tabletop games. Employment conditions in video game studios vary immensely. What Chris Crawford said 15 years ago is still true today, there are so many people who want jobs in the video game industry that the employers have supply and demand on their side; in that situation, employees are often treated poorly. The Beta is available in some inexpensive bundles (which I thought were piracy, but are not!). But game design goes on in the mind. There is little to show. I can show someone making a map for a game, I can show people talking about game design, I can talk about game design, I can show you a game being playtested: but I cannot show you game design, because it's internal, not external. I think many people don't quite understand that. Yet recently I’ve been made aware of the gamedev threat on Twitch TV, live streaming. Most of the streaming shows someone playing video games, often watched by thousands. Gamedev shows game developers crunching their code while occasionally answering questions from the viewers. Still not much to show, but it works for several dozen viewers! Yet it’s about programming much more than about game design. 4. Population becomes too high for current agricultural technology, banditry erupts, anarchy reins, famine widespread, emperor/dynasty overthrown, population plummets - that is, back to 1. Though it must be said, sometimes external invaders come into it, though usually the invaders succeed in bad times and fail in good times. Sometimes one dynasty was immediately succeeded by another, sometimes a period of warring states intervenes. Detailed, some interesting points of view both in the kinds of designers, and in the crap he has to wade through. I don’t know his company or even country, though the name is Slavic and English is not his first language. Game designers are basically divided into 2 types: Game designers - storytellers and game designers-mathematics. The first ones see their role in developing a “feeling”, writing a plot, quests, items descriptions and game universe backstory. Second ones are all about balance design, economics, gameplay formulas and calculations. In all conscience, most designers unite those skills but usually they focus on the one side more than on the other. Usually, I hunt people with math\programming background and surely add this condition to our vacancy, which helps immediately cut off a half of unsuitable candidates and save some time. "First of all, I isolate infants, crazy dreamers, too juniors without any experience and strange guys who send me messages like ”Yo, wanna work in your company, I have a lot of ideas, but won’t share them with you, mail me dude” and instead of useful skills they point their love of anime and coffee." "It is very important to catch a free-to-play haters, ideological pirates and peoples who stuck in the past. To understand how to make free-to-play games it is necessary to play and pay by yourself." "Recommendations are a very useful tool in hiring, which unfortunately [are] often ignored. It is great if a candidate can provide a few contacts of his previous employers but if not I do not hesitate to contact them by myself and get a feedback about candidate’s performance." The game is vaguely reminiscent of L'Attaque/Stratego, but immensely more fluid and less hierarchical, quite a different (and I think, better and much shorter) experience than Stratego. While I haven’t consciously adopted a "philosophy" of design, these are my observations of what happens. I design two kinds of games. One kind is strategic, I hope with some gameplay depth, and highly interactive (like Britannia or Dragon Rage). The other kind is "screwage" games (where you "mess with" the other players) that are not very strategic, but provide a fair bit of interaction within the game (though this varies)(like Sea Kings.). I am no longer a big fan of two player games, and even when I design something that is two player, I try to provide for partners play. The strategic games tend to be 2-3 hours long, the screwage games under an hour. Some of those games can be played quite quickly, but I don't design games that are intended to be less than half an hour, because such are bagatelles ("a thing regarded as too unimportant or easy to be worth much consideration".). I prefer fairly simple-to-play games over fiddly, rules-complex, or many-pieces games. I avoid any deliberately-added complexity. My motto is "A designer knows he has achieved perfection not when there is nothing left to add, but when there is nothing left to take away." - Antoine de Saint-Exupery. Another form, about Japanese gardening actually, is "Your garden is not complete until there is nothing else that you can remove." I dislike puzzles, things that have always-correct solutions. Like most Eurogames (not all) and most single-player video games (not all). I try to keep the number of pieces, cards, and other Stuff a player controls to under two dozen in multi-player (more than two players) games, and under three dozen in two-player games. Strategic and tactical complexity can be achieved without large numbers of elements to keep track of. On the other hand, I am not of the "I only want a few alternative choices" school. In other words, a chess-like element is often in my games (lots of different possibilities, though few pieces). I have simplified some of my games (generally the screwage card games) to the point that only a few practical moves need to be considered each turn. Part of the "chess-like" method is that you must watch every move your opponent(s) make, and react to it. (Though the reaction can be to ignore it, you have to figure that out, not ignore it to begin with.) If you don't "watch like a hawk", you are very likely to lose. I try to reduce the effects of chance in strategic games, either with lots of die rolls that will tend to "even out" (Britannia) or by using elements such as cards that players have some control over. The more cards are used in a board game, the less dice should play a part. I design games, not simulations. I prefer players to have control of their pieces; perhaps they can’t do everything that they want to (that’s good, it makes them make choices), but there is no random element that prevents them from doing something with their pieces, however realistic that may be. In the end, it’s a game. Hence, I have little interest in many of the more recent additions to wargames that model the huge uncertainty of warfare such as "chit pulls", activations, and "card driven". I like the game to represent something, to be a model. In many Euro-style games, the atmosphere (often wrongly called theme in this case) is "tacked on" (and could be changed considerably), and the players are entirely concerned with pure mechanics and with the other players. I like to be able to understand that when I move something in the game, or do something in the game, it’s something like an event that could happen in reality. And when something happens in a game, it could have happened in reality. Having been educated in history, I am far more skeptical than most about relating real-world events to game events. An historical game can teach the players something about history. I am not, however, of the "what if" school of varying one factor or one decision to "see what would have happened". My games tend to be at a high (strategic) level where it is practically impossible to "model" the factors that produced history, so it is rarely practical to use the "what if" query. So I model effects, not causes. Despite all that, I do design the occasional fairly abstract game, because abstract games are a form of "pure" game. What I rarely do is design an abstract game but pretend it's something else. People play games for many reasons. I play either (in cooperative games such as D&D) to "succeed in the mission" and keep everyone on my side "whole", or (in competitive games) to win the game. I like to know the rules of a game thoroughly; I much prefer to read a set of rules rather than have someone teach me, probably because I want to thoroughly know what’s going on. I recognize that the rules-reading preference, in particular, is a minority view! Nonetheless, I tend to design games that I like to play, though I design games for other people, not for myself. If You Can’t . . . If you cannot explain why an element is in the game, why it works as it does . . .
Shouldn’t you take that element out, or change how the game works? The result: you might get poor results from employers and publishers, and even from programmers, artists, etc. Why should they trust your gut feelings, after all? Most every game involves both intellectual and emotional decisions. But most studios and publishers cannot rely on the inexplicable. I will appreciate any support I receive - and there are a few perks involved, as well.